Naomi is taking a well-deserved break this week so I wanted to take the opportunity to re-post one of Naomi’s most popular pieces, and one that has become increasingly relevant in recent weeks as heated issues are discussed both online and offline. Where do you stand on this issue? Don’t miss the new poll at the end of the post! In 2013, Naomi will be expanding her advice to offer something extra for readers. As founder of the incredible Sisterhood of the Traveling Books, Naomi is perfectly placed to provide fantastic and savvy tips on Goodreads, ebooks and more. Please let us know what you’d like to see covered in 2013! With political statements appearing anywhere and everywhere right now, is there a line to be drawn between your author persona and your own personal political stance? Naomi Blackburn shares her thoughts on this important issue. As The Author CEO has progressed, I’ve visited more and more social media sites and author websites, and I’ve noticed an overabundance of political posts, having nothing to do with the author’s books. Most of these political posts aren’t even pertinent to the author’s writing. In business, discussing politics or religion in the workplace is one of the biggest taboos. We will discuss religion at a later date. Today, I want to focus on politics. It can be fun and passionate to debate political views-heck, I do it myself-but it is something that should be done in private. Argue politics in a business setting and this lack of judgment can be costly in regards to followers and book sales! Discussing politics-a big NO-NO in the workplace! I’ve been a political junkie for as long as I can remember. One day, when I was a newbie in the business world, my manager overheard me discussing a congressional race with a co-worker. After pulling me aside, my manager chastised me for discussing politics in the work place – it was a NO-NO! Now, I, being a young’un at that point, couldn’t see the harm in doing this. Now that I have, hmm-hmm, matured, I get it! If you’re shaking your head, not sure you agree, take a look at the polls. Politically, this country is split right down the middle-and political news draws impassioned, often angry responses. If I were to engage in a political discussion, chances are I could offend-even be viewed as looking for a fight with-the people I interact with. Like religion, politics is a very touchy subject. Political arguments have led to brawls in the workplace. For an author, verbal brawls result in the loss of potential or current readers! Do you really want potential readers to pass on your book without giving it a fair shot? A friend recently asked me to review her resume. She had just finished her MBA, was starting her job search, and wanted to make sure all was copacetic prior to starting to send out her resumes. One of the things that jumped out at me was her statement about working on a presidential candidate’s campaign. While she was proud of her work with the campaign, it had nothing to do with the position she was applying for. I informed her that the average recruiter gives each candidate’s resume 30 seconds before either moving it forward or passing on it. A candidate should never give a recruiter any reason to automatically pass, particularly because of an easily avoidable issue like a difference of political opinion. Readers are the same way. With an overabundance of choices, readers can look for reasons to take a pass on your book. While it might seem unfair, this is life! Do you really want to risk this? Do you want to get into a political debate with a potential/current reader that could result in a loss of sales? An author’s websites and social networks are his or her workplace! Authors – it’s crucial to realize that your social media sites and websites are not only your resumes, but your worksites, as well. When potential readers go onto your sites, they want to know about your books: sometimes they want basic information about you, but mainly they care about your books. As already mentioned, 50 percent of potential readers do not agree with your political beliefs. As a business person, do you feel that it is smart business to potentially offend prospective customers? Are you willing to lose cash in hand to voice your personal beliefs? Unless you write about it professionally writing about political issues should be non-existent on your sites! Have two sets Twitter and accounts, one public and one private. Use only the personal accounts to discuss your personal beliefs. Don’t forget to check your settings – be sure the personal accounts are set to private, so only those you wish to share with can see them. Use Facebook pages for professional marketing and your profile for your personal networking. Invite professional contacts to follow your page. Keep personal contacts separate. I rant and rave about politics on my personal FB profile and Twitter account, but they are well hidden so that professional contacts cannot find them. Facebook allows pages to be created. You can establish a presence online and keep your personal profile separate. Very Important!! 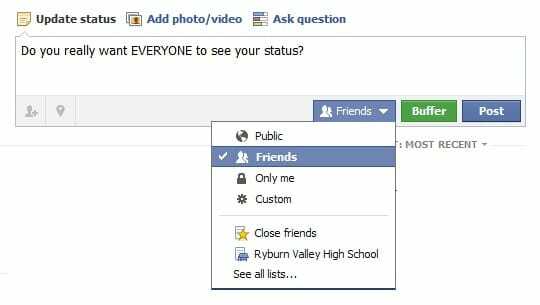 Set your Facebook posts to Friends. This is done by clicking on the globe in the ‘What’s on your mind?’ box and changing it from ‘public’ to ‘friends’. Friend only real life friends on your personal accounts. I have a friend who had combined the two and had both business acquaintances and friends on his ‘friends’ list. He posted pictures of himself holding a shark he had caught off the coast of Florida. Problem was he had been sent down to Florida to attend a healthcare conference by the hospital he worked for. Whoopsie! This simple mistake could have led to the loss of his job. Within a couple of days, he let his business acquaintances know he would be removing them from his Facebook page! So, have I drilled it in enough?? Remember, you are small business owners and first and foremost. You need to focus on building revenue from book sales! Don’t let political differences get in your way! Great post! I completely agree. I rarely post political comments on my personal page. I have friends that would easily be offended by some of the comments I see others posting. My belief on that is that while my views on certain issues may be important to me, the relationships I hold in my heart are more important. A difference of opinion is not worth the loss of a friend. So many people comment as if political issues are black and white. I'm of the belief that there is an abundance of grey, and I choose to live in the grey. Beautifully said, Schledia! People are SO much more than there political views. Also, doesn't an author want to be recognized for their works versus their political beliefs. After the election, an author innocently posted a note on his Facebook page that really wasn't that offensive, but it was taken totally out of context by some of his followers which then started a war on his Facebook page amongst his fans. Because he came out in support of some of the fans, he had a couple of fans say that they would never buy his works again. I, as a reader, was appalled!